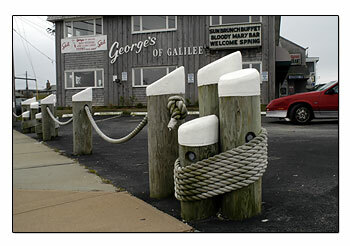 George's of Galilee is a very popular restaurant that sits near the water at Galilee RI. It's right across the street from Champlin's Seafood Restaurant. George's Restaurant has inside dining upstairs, with a variety of seafood, and a bar. Outside, is a patio, downstairs is a Takeout in front, and a snackbar in back for the beach bathers. 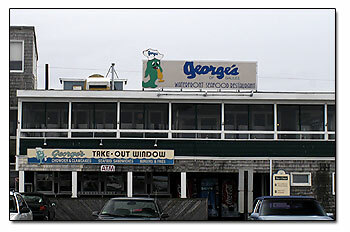 George's Restaurant is famous for their clam chowder. They also have a bar and live music. I don't know why, but every time we come to Galilee RI, it's cloudy and overcast. So, no, it's not true that we have sunny skies in New England all the time. Recently Georges partnered up with RI Bay Cruises for a really nice day trip. 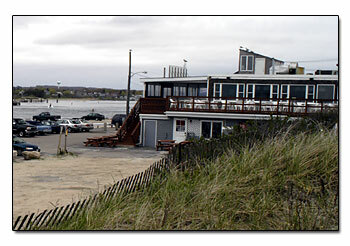 They are the largest and oldest waterfront seafood restaurant in RI, family owned and operated since 1948. They have a rich history in RI and are considered a landmark. They were just on the Phantom Gourmet show in Boston and was just featured on CNN's website last month. Here some a Georges Restaurant sample menus. The prices are unbeatable! South County trolley a 2 hr narrated tour of the historic center of Narragansett and surrounding areas. The narrator knows the history of this area more than anyone. Rhode Island Bay Cruises a 90 min cruise on a luxury high speed catamaran that features all the lighthouses in the bay, the islands, Newport harbor and Battleship Cove among other things.